An overview of Mathieu Deflem's work. Click here for my complete CV. My main scholarly interests are in sociology of law and social control, popular culture, and theory. In the area of law and social control, my work primarily focuses on three themes. First, recent research involves a study of the global diffusion of terrorist anti-police violence. This work extends from my research on the police dimension of counter-terrorism that culminated in my book The Policing of Terrorism (Routledge 2010) and two edited volumes on the sociology and criminology of (counter)terrorism. Second, I research the history and contemporary conditions of international police cooperation. This work culminated in a book, Policing World Society (Oxford University Press 2002), and several research articles. Third, I connect my interests in law and social control with theoretical issues in sociology. In my book Sociology of Law: Visions of a Scholarly Tradition (Cambridge University Press 2008), I analyze the history and systematics of the sociology of law. Building on these interests, I edited a 32-chapter The Handbook of Social Control (Wiley, 2019) in which leading scholars discuss a broad range of issues and dimensions of social control. I also study contemporary issues of popular culture, especially fame, music, and cinema, themes which connect with my background in cultural sociology and anthropology. Most recently, I published my book Lady Gaga and the Sociology of Fame (Palgrave 2017) and several papers on music and fame following a rather famous course I organized (www.gagacourse.net). Relatedly, I also teach and write on other cultural themes, such as the movies of Alfred Hitchcock, music censorship, and the anthropology of Victor Turner. My work is always closely connected with important questions of sociological theory, a specialty I have also explored in its own right, especially concerning discourse theory, systems theory, and sociological structuralism. Much of my research is also of a comparative/international and/or historical nature. See the Books and Articles & Essays pages for related writings. Undergraduate courses: Sociological Theory; Society Through Visual Media; Lady Gaga and the Sociology of the Fame; Sociology of Deviant Behavior; Sociology of Social Control; Sociology of Law. Graduate seminars: Advanced Sociological Theory; Classical Scholars; Contemporary Scholars; Scientific Methods and Sociological Inquiry; Theoretical Foundations of Sociology; Criminological Sociology; Sociology of Law and Social Control; Comparative and Historical Sociology. See the Teaching Pages for further information. I was born in Belgium, where I grew up in Stokkem and attended high school at St. Jan Berchmanscollege in Genk. I studied at Katholieke Universiteit te Leuven, receiving degrees in Sociology in 1986 and in Cultural Anthropology in 1987. In 1990, I obtained an MA from the Department of Sociology and Anthropology at the University of Hull, England. Between 1989 and 1992, I was an assistant in the Criminology program at K.U. Leuven, whereafter I came to the United States and received my PhD in sociology from the University of Colorado in 1996. I have since held positions at Kenyon College, Purdue University, and the University of South Carolina, where I have been since 2002. Ph.D. Sociology, University of Colorado, Boulder, 1996. 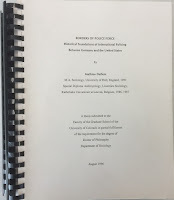 Dissertation: “Borders of Police Force: Historical Foundations of International Policing Between Germany and the United States.” A revised version was published as my first book, Policing World Society (Oxford University Press 2002). M.A. Sociology of Developing Societies, University of Hull, England, 1990. Special Diploma Social and Cultural Anthropology, Katholieke Universiteit te Leuven, Belgium, 1987. Licentiate Sociology, Candidate Social Sciences, Katholieke Universiteit te Leuven, Belgium, 1983, 1986. Professor (since 2010), Associate Professor (2005-2010), Assistant Professor (2002-2005), University of South Carolina, Department of Sociology, Columbia, SC, 2002-present. Assistant Professor of Sociology, Purdue University, West Lafayette, Indiana, 1997-2002. Visiting Assistant Professor, Kenyon College, Law and Society Program, Gambier, Ohio, 1996-1997. Graduate employment: Assistant/Instructor, Department of Sociology, University of Colorado, Boulder, 1992-1996; Assistant, Katholieke Universiteit te Leuven, Belgium, Department of Criminology, 1989-1992.